It was important to look at the site in broken-down sections and look at the character of the adjacent neighborhood, according to the architect. It’s an enviable spot: TriVista sits on the doorstep of downtown Denver, a stone’s throw from the banks of the Cherry Creek. A block south of the Colorado Convention Center in Denver’s Golden Triangle neighborhood, the seven-story, 322-unit apartment building is named for three different panoramas: to the west, the mountains; to the north, downtown; and to the east, the Denver Art Museum and the heart of the Golden Triangle’s Cultural District. Each side has different branding – respectively, the glass-walled View Houses, the brownstone-inspired City Houses and the more whimsical Art Houses. The last of the three “responds to the lively character of the Golden Triangle,” says Kate Millenson of KTGY Architects in Denver. She previously worked on Legacy’s Point 21 apartment project in downtown Denver. 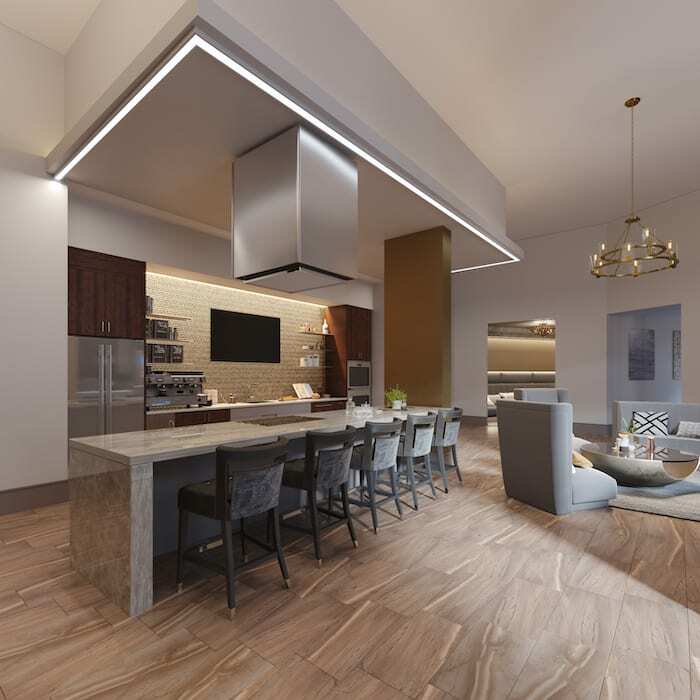 TriVista’s commercial-grade community kitchen meets “robust” construction and ventilation standards equivalent to a new restaurant, according to the builder. The design allows a building that spans two city blocks to interface with existing development. “From a building massing standpoint, that was the hardest thing,” says Millenson of the 550,000-square-foot structure. The Golden Triangle’s registered neighborhood association provided input that helped shaped the design. “They really positively affected the project,” says Millenson. An example: four live/work units on the 14th and Galapago streets corner, seen as a gateway to the Golden Triangle. The first floor features a storefront and gallery or office space, with living quarters on the second floor. He says CFC’s “cost-saving solution” were Geopier Rammed Aggregate Piers (RAPs), which increased the bearing pressure of the ground and minimized the depth of excavation. Peterson Contractors installed 2,440 RAPs in a design by Ground Improvement Engineering. Groundbreaking was in February 2017. After a little more than two years of construction, the first move-ins come in March; apartments average 935 square feet. TriVista features 14,000 square feet of amenity space, including a wine cellar with individual lockers, game room, two-level fitness center, bicycle repair shop and coworking-inspired office space. Smith says the construction process was “about as good as it gets” with minimal construction hiccups and maintaining the planned calendar. “Legacy has been a great client and partner in the project, and we have enjoyed a productive relationship with them throughout the project,” he says. “We have also done over $300 million worth of projects with KTGY since the recession, and they have been an invaluable partner. “Our shared understanding of these projects and what it takes to make them successful – which can be most simply stated as properly detailed drawings and the right approach to construction – proves positive time and again, and TriVista is no exception,” Smith says.